Click the picture to view the newest Free I.T. 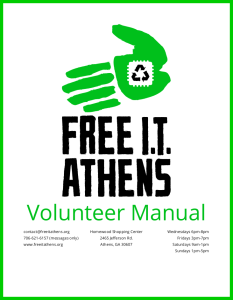 Athens Volunteer Manual! The volunteer manual was badly in need of an update, so volunteers dusted it off and fixed it up. We’re proud to say it’s finished! a list of volunteer perks, such as taking home a free laptop for meeting volunteer milestones! Click here to view the newest version of the Free I.T. Athens Volunteer Manual! Is there any information you would like to see in the next update of the Volunteer Manual? Let us know by sending an email, tweeting @freeitathens, or leaving a comment on FaceBook.